When the possibility of a clash with the British became real, New England farmers began to arm themselves and train for battle. These troops were dubbed "minutemen" because they could be ready to fight in a minute. 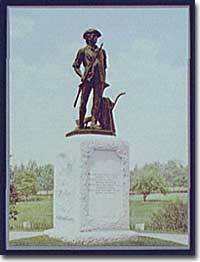 This monument to the minutemen stands in Concord, Massachusetts. How could the Americans ever hope defeat the mighty British Empire in a military conflict? Americans faced seemingly impossible obstacles. When the guns fired at Lexington and Concord in 1775, there was not yet even a Continental Army. Those battles were fought by local militias. Few Americans had any military experience, and there was no method of training, supplying, or paying an army. Moreover, a majority of Americans opposed the war in 1775. 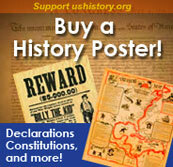 Many historians believe only about a third of all Americans supported a war against the British at that time. Further, the Colonies had a poor track record of working together. How, then, could a ragtag group of patriots defeat the British? The Battle of Bunker Hill was not a military victory for the colonial forces, but it served as an important morale booster. 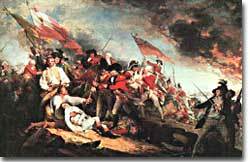 The colonists inflicted heavy casualties on the larger, more powerful British forces. In June 1775, the colonists failed to prevail at Bunker Hill, but inflicted heavy casualties on a vastly superior military force. A year later, in 1776, while the British occupied New York, Washington led his army to two surprise victories at Trenton and Princeton that uplifted the morale of the patriots. Regardless, by 1777 the British occupied Philadelphia, the seat of the Continental Congress, and sent that body into hiding. The British also controlled New York City and pretty much had their way in the waters along the Eastern Seaboard. In fact, there was no Continental Navy to speak of at this time. Meanwhile, the British began mounting a southward attack from Canada into upstate New York. This threatened to cut New England off from the rest of the Colonies. The Battle of Saratoga, in northern New York, served as a critical turning point. The British attempt to capture the Hudson River Valley ended with their surrender to General Horatio Gates in October. Washington, having lost Philadelphia, led his troops to Valley Forge to spend the winter. None of the world's powers had come to the aid of the patriot cause — yet. In early 1778, the French agreed to recognize American independence and formed a permanent alliance with the new nation. Military help and sizable stores of much-needed gunpowder soon arrived. The tide was beginning to turn. 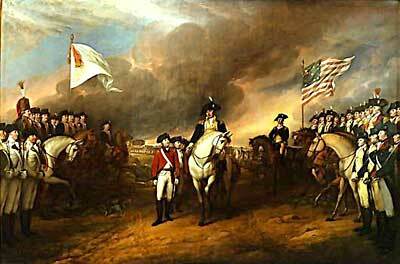 The surrender of Lord Cornwallis at Yorktown marked the end of the Revolutionary War. This painting by John Trumbull is 12 feet by 18 feet and hangs in the rotunda of the U.S. Capitol Building. The British grew increasingly frustrated. The loss at Saratoga was humiliating. Capturing the enemy's capital, Philadelphia, did not bring them much advantage. As long as the American Continental Army and state militias remained in the field, the British had to keep on fighting. And no matter how much damage the British did to American cities or private property, the Americans refused to surrender. This was a new type of war. Having failed in the north, the British turned their attention to the south. They hoped to inspire Loyalist support among dissatisfied Americans — a hope that was never realized. Fighting continued. The threat of French naval participation kept the British uneasy. In October 1781, the war virtually came to an end when General Cornwallis was surrounded and forced to surrender the British position at Yorktown, Virginia. Two years later, the Treaty of Paris made it official: America was independent. How could the Americans ever hope defeat the mighty British Empire in a military conflict? Perhaps an even better question to ask is, How did the mighty British Empire ever expect to vanquish the Americans? In the days before Tom Cruise and Mission Impossible, spies used secret codes, mask letters, quill letters, and invisible ink to deliver messages to the enemy. Dearest Friend, The Day; perhaps the decisive Day is come on which the fate of America depends. -Abigail Admas (1775). So begins the future first lady's letter to her husband, John Adams, following the Battle of Bunker Hill. At the Battle of Saratoga, Benedict Arnold was shot in his left leg and as a result had a limp for the rest of his life. A monument to Arnold's leg can be found at Saratoga National Historical Park.